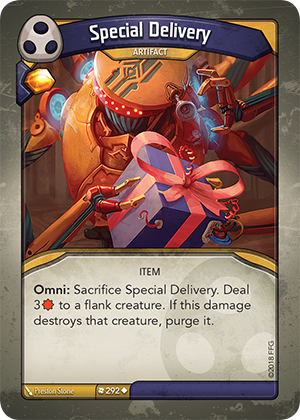 Card Text Omni: Sacrifice Special Delivery. Deal 3 to a flank creature. If this damage destroys that creature, purge it. If a creature is purged by Special Delivery, does its “Destroyed:” ability trigger? Yes. “Destroyed:” abilities trigger immediately before the creature is destroyed. Therefore, “Destroyed:” abilities will trigger before the creature is purged. What happens if Special Delivery destroys a creature with an ability such as “Destroyed:” Return Bad Penny to your hand”? The creature goes into its owner’s hand before Special Delivery can purge it. “Destroyed:” abilities resolve immediately before a card would be destroyed. Therefore, the creature’s “Destroyed:” ability would trigger and return it to its owner’s hand, after which Special Delivery cannot purge it anymore.